It was a beautiful Tuesday to play hooky. Half the world’s hikers seemed to agree, and the Old Rag parking lot on the eastern edge of Shenandoah National Park was nearly full. Per Hiking Upward, “this hike gets a [zero] star rating for solitude,” no kidding. Thankfully, not a single one of those dozens of cars except ours brought any fly fisherman. The water was high from all the recent rains. 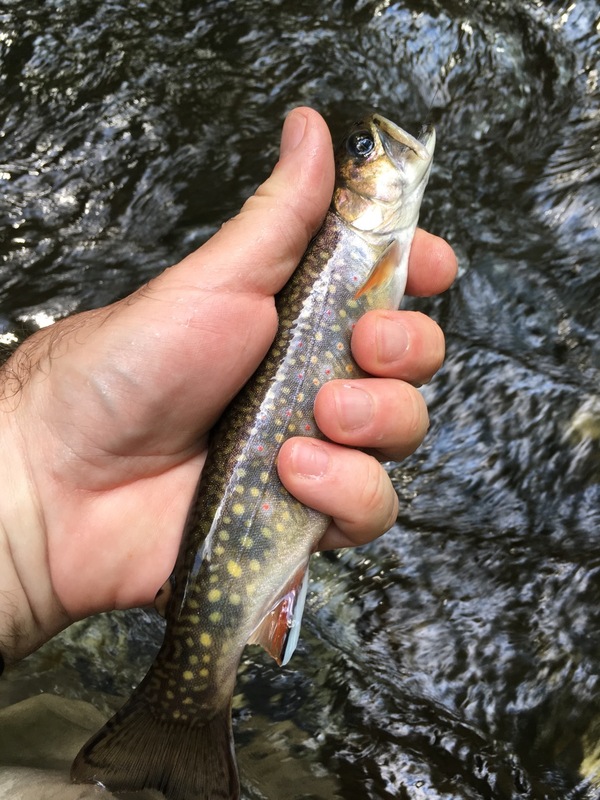 We fished Brokenback Run first, a new stream for me. It seemed less affected by the rain, and we found quite a few eager fish. We decided to cut that short after a couple hours and hike up the Hughes River, which is nearly always in decent shape. The water was very high, and it probably would have been better to hike down from Skyline Drive. Still, we managed several nice fish, and tiptoed around two water snakes, which is now a common occurrence on our excursions as it’s late spring.